A: I don’t have a favourite as such when it comes to fairy tales but the one that definitely rises to the surface whenever I think back to stories that influenced me at a young age; is the story of ‘Tailypo.’ The actual story itself is more of legend that found its way into the fairy tale simply by it being repeatedly told until it became commonly told to children and used as a cautionary tale. I remember it being one of the first instances realising that what I was enjoying, and what I really wanted out of the story, was an unhappy ending, I quite enjoyed the fact that the ending was left more or less open to your imagination and you yourself were able to fill in the details as to what becomes of the lead character as well as the story having the guts to give us a dose of realism. The idea of that sort of brutal honesty in a story, when everything else in fairy tales seemed (at the time) dressed up to shield the young reader from realism, had me quite enamoured. The fact that Tailypo started as a legend, with no author claiming ownership, also gave it a root in reality and a certain mystique that something like Goldilocks and The Three Bears just didn’t have straight off the bat – and the fact that there were so many variations on it also made it seem like it needed investigating. Subsequently; everyone I would tell it to would have a different version to trade and I would trade stories, gladly, until I built up my own personal mythos about the legend and it’s very dark message. In some ways, on a very basic level, it is a perfect story and is still a story I ‘check in on’ from time to time to see if anyone else has added a new version to the mix. 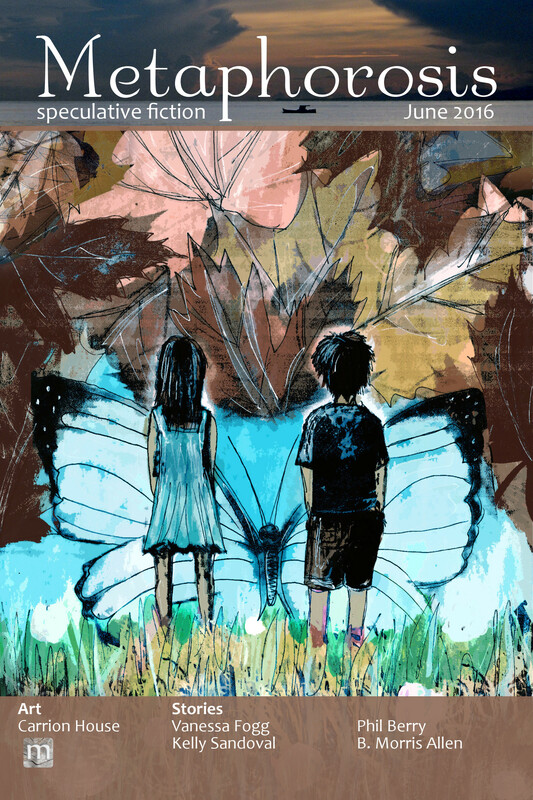 Luke Spooner’s image “Leaves and Butterflies” is the cover art for our June 2016 stories.